Washington (AFP) - Foreign-based US Navy ships are suffering a slew of problems that are raising risks and impacting military readiness, a government watchdog warned Thursday in the wake of two deadly maritime mishaps. A review by the Government Accountability Office (GAO) found that crews are being overworked and undertrained, just as vital maintenance is not being completed on time. Problems are particularly apparent in vessels ported in Japan, home to the Navy's Seventh Fleet, from where ships sail from Yokosuka and Sasebo on vital operational missions in the South China Sea and off the Korean Peninsula. "The Navy has been warning for some time that they have been keeping a pace that is unsustainable. Our work has confirmed the difficulties," said John Pendleton, a director at GAO. 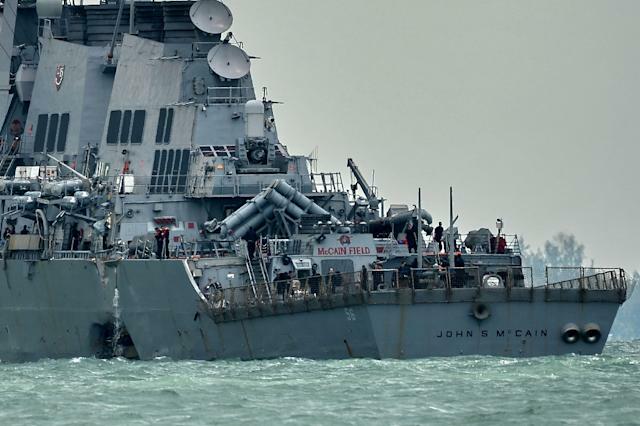 Last month, the USS John S. McCain collided with a tanker as the destroyer was on its way to Singapore, tearing a huge hole in the hull and leaving 10 sailors missing and five injured. In June, the USS Fitzgerald -- also a destroyer -- smashed into a Philippine-flagged cargo ship off Japan, leaving seven sailors dead and leading to several officers being disciplined. Two non-deadly incidents occurred this year -- in January, the USS Antietam ran aground near its base in Japan and in May, the USS Lake Champlain collided with a South Korean fishing vessel. According to an updated GAO review, which began studying naval readiness in 2015, the number of sailors lacking current training certifications has risen five-fold in just two years. As of June this year, 37 percent of the warfare certifications for cruiser and destroyer crews homeported in Japan had expired, and over two-thirds of these had been expired for five months or more, Pendleton said. US lawmakers are gobsmacked that a warship could collide with something as big as a tanker or a freighter, and the Navy is even looking into whether cyberattackers may have played a role. "Two destroyers, 17 lives… something is definitely wrong," said Democratic Congressman Anthony Brown at a hearing attended by Pendleton and other officials, as well as the mother of one of the sailors who died aboard the USS McCain. While some experts believe that being able to engineer a collision would be unlikely, given the security systems of the US Navy and the logistics of having two ships converge, others say putting the recent incidents down to human error and coincidence is an equally unsatisfactory explanation.